This is the largest stove in our range. 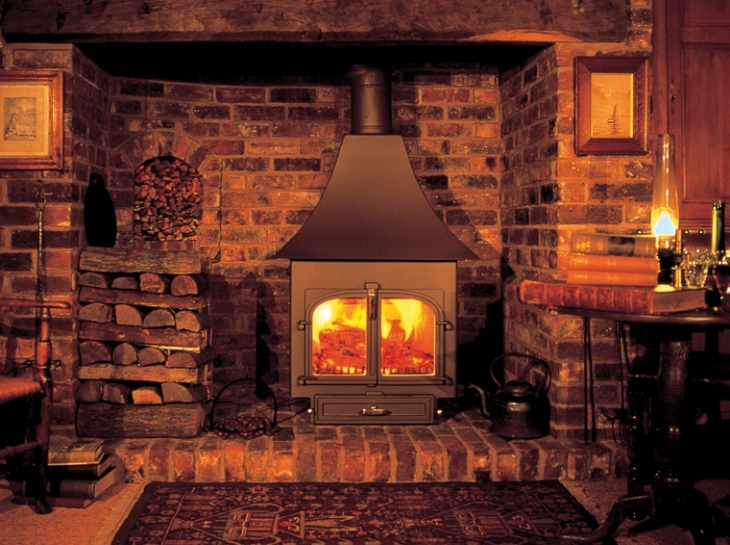 Its classic proportions and high heat output make it the ideal stove for larger rooms, halls and open plan areas. The illustration shows a High Canopy 750 in our original show rooms where it was effortlessly heating a space 36 feet x 18 feet open to a ridge height of 18 feet. Two large Clearview double glazed doors that give an impressive view of the flames. Clearview hot air-wash system for really clean burning without fuss or pampering. Independent up draft and down draft air distribution system for maximum response and control. Refractory lining, promoting clean combustion. Multi-fuel grate, for easy lighting and rapid response. Heavy steel construction – welded inside and out for durability and long life. All “wear and tear” stove parts are easily replaceable. Solid brass knobs and door handles. Stainless steel ash pan for long life and easy ash removal. Adjustable levelling bolts, for easy adjustments on uneven hearths. Adjustable hinges and door catch to maintain air tightness throughout the life of the door seals. Large hotplate surface for coffee pot or kettle on the Flat Top and Low Canopy version. Takes up to 18 inch Logs. From design to installation Darren and Mark were very friendly, professional and enthusiastic about our fireplace projects Darren was extremely helpful with the initial designs and we are delighted with our two new stoves. We were hoping to have different styles of fireplace and stove in each room and they have certainly delivered on this! We are very happy with the results and would certainly recommend them.